Lisa and I played a game of Kreta the other night and I think the game is broken with two. Lisa had a rough start and I was able to get a substantial lead. About two-thirds of the way through the game we were fighting pretty hard for different territories as the fort cards flipped by. We then, however, entered the twilight zone where it only made sense for each of us to play the Kastelan card as our first play. The last third of the game was played out in about five minutes in a flurry of scoring rounds. Is this game broken with two or did we just encounter a rare situation? I remember a game of Piratenbucht that Sophie, Noah, and I played once where we only battled once the entire game. Now that’s whacked! It completely ruins a pirate game when you ain’t doing no plunderin’ er pillagin’. Arg! AGN – November 2006We met at Paul’s house for the November 2006 session of Analog Game Night. Thanks for hosting Paul! We had three members that could not make it so we ended up with a small group of only five. Five isn’t the loneliest number that you’ll ever know but it sure beats six. We usually split into two groups with seven but with six it’s a struggle. We don’t have a lot of six player games and we play them so rarely that it takes us forever to scan the rules, set up, play, rules check, etc. that five is our sweet spot. I had read up on the rules to Manila (designed by Franz-Benno Delonge) and I was itching to play my first real game so I pushed to play that. After a quick set up and the rules explanation, the punts got underway. I missed out at being Harbor Master on the first voyage and ended up with a pretty good cash payout but my shares were useless. After two more missed opportunities as Harbor Master I was cash rich but my shares of ginseng and nutmeg/mace were in a sorry state. Ken and Keith had been Harbor Master for the early part of the game and were scoring on some nice stock purchases but were slowly depleting their cash resources. After my midgame control of the Harbor Master I was cash poor but in a much better stock position. I was concerned about my nutmeg shares though since brown wasn’t progressing along the black market chart as quickly as the others. Ken was strong in jade and Keith had diversified across the board. In the end, Keith came out the winner with his nice portfolio. Good job Keith. I enjoyed Manila quite a bit and would gladly play again. Nobody encumbered any shares and I suspect that is common for new players but uncommon with experienced players. Our bids for Harbor Master hovered in the mid to low teens. I’m unsure how that will compare to subsequent games but my gut feeling is that there are times where it would be worth pay as high as 20 or so for the opportunity to control the punts. Without more experience though, I’m not sure when that would occur. My initial reaction is that with five players the punts load quickly decreasing the allure of being a pirate if you’re not playing with the variant where you can kick off an accomplice to board at the end of round two. In general, it seems that the cost of being a pirate (5 pesos) is too high for the risk. We don’t have very many games involving dice but I think the group enjoyed the ‘bet the odds and take your lumps with the dice’ feel to the game. I do think that the game separates the potential winners from the definite losers in short order. If you’re out of the running early then I think it would be tough to get back in. But if you’re in the running, it’s tough to tell who is going to come out on top until the last voyage. As a closer we pulled out China. I’ve played China several times but it’s been a little while so I ran through the rules and we were off to the races. 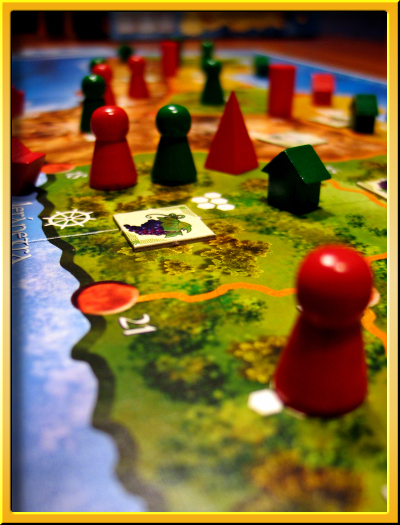 China is a nifty area majority game from Michael Schacht where players play houses and emissaries into regions depicted on a map of China. Filling a region with houses triggers the scoring of that region. Emissaries are an end-game strategy granting points to those players who have the majority of emissaries in adjacent regions. The mechanics force players to make decisions about placing houses and/or emissaries under severe limitations. You must be keenly aware how the placement of additional houses eases restrictions on other players when placing emissaries. Our gameplay progressed like chaos on a stick. If memory serves me right, emissary points were awarded only three or four times at game end. 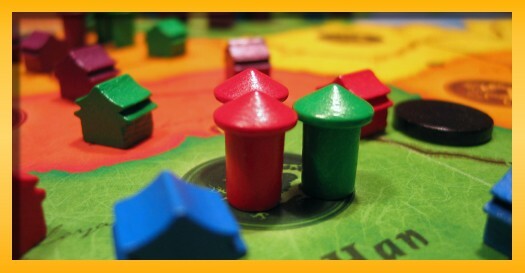 In most games I’ve played in the past, new territories were entered only when a player felt forced to make the move due to the high cost of entry (you can only place a single house when opening up a new territory). In this game however, players were opening territories left and right leaving the emissary position ripe for the taking. Unfortunately, emissaries were being plopped down in rather odd locations making the task of getting dominance in adjacent territories difficult. I really like China and find it a surprisingly meaty game that fits in the timespan of a longish filler (30-45 minutes). 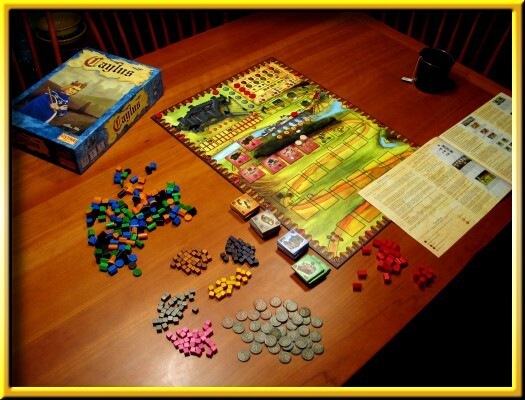 I finally broke down and cracked open my copy of Caylus tonight. To say I’m ashamed to have not played the game yet is really kind of silly. It’s a boardgame and not an event of real import. 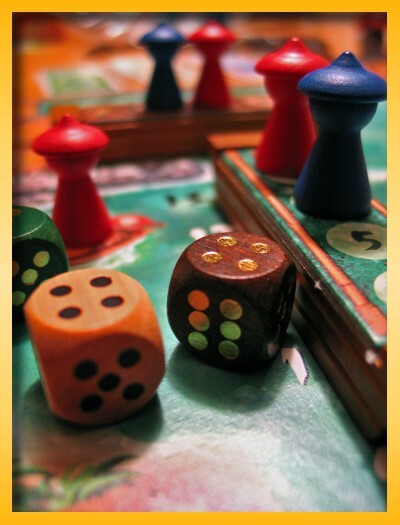 I can’t expect of myself to have played every ‘great’ game that takes the BGG ratings by storm. I am, however, ashamed to have not opened it and read through the rules until now. I’ve owned the game for months having stored it on my game shelf since last father’s day. I’ve made it through about two thirds of the rules on an initial pass and it’s setting my rule pet-peeves all atwitter. My biggest complaint is that relatively complex rules tend to stay in character. Because of this phenomenon, we’ve got Prestige Buildings, Residences, Craft Buildings, etc. rather than Blue, Green, and Brown tiles. It may be a personal deficiency but I’m constantly translating themed words into physical game components and I’m very bad at making those translations stick. In the end, I suspect most people describe the tiles as blue, green, etc. and the cubes as pink, brown, gray, etc. rather than their themed counterparts. I appreciate a rich theme to act as a lubricant for comprehending the mechanics. But at times, “the little white thingy” makes more sense than “the Provost”.